You may also want to check out a post by my pal Dan Brinkmann titled “Microsoft Created a Spork” for another informed take on the device. The first thing that hit me when I took the Surface Pro 3 out of the loaner bag and started setting it up was the attention to detail on this device. I have a Surface Pro in my office, which I really can’t stand, and that thing is so obviously a first generation product compared to the Surface Pro 3. The original Pro is also a monster thickness-wise compared to the Pro 3 – seeming almost like a DUPLO brick compared to a standard LEGO brick. Everything about the Pro 3 screams quality. It feels like a high quality device – and it should, as it’s a fairly expensive device. I was impressed with the kickstand in the Surface Pro 3, and while it didn’t solve the lapability issue for me (more on that later), I know it has for some people. I was worried at first that the kickstand might not hold up, but I made no effort to be gentle with it and it wasn’t any worse for wear after several weeks of use by me than the day I received it. The dock impressed me the most of the accessories included with my loaner Surface Pro 3. It’s solid and well-built, which is a welcome change from the lightweight and cheap-seeming Dell E-series docks I’m used to at work. I liked the way the sides snapped apart to accept the Surface Pro 3 and how firmly it locked into place around the device. I used a Dell Latitude E7440 and dock as my primary machine for a little over a year, and I was never 100% certain the laptop had locked into place in the dock, at least not as sure as I was with the Surface Pro 3 and it’s dock. I could see myself using a Surface Pro 3 and dock as my primary workstation. My only concern about the dock is that it lacks multiple video out ports. Microsoft says you can daisy chain monitors from the Mini DisplayPort connector on the dock, or connect one monitor to the dock and one to the MiniDP port on the Surface Pro 3 (which is what I would need to do), but that would make docking and undocking more complicated. I’d probably just grab a nice 27” monitor and be done with it. The stylus also worked really well. It felt good in my hand, in a way that most styluses have not. I didn’t use it a great deal, because frankly my handwriting it terrible and only worse when writing on a screen, but as someone who has tried a number of truly terrible iPad styluses, I like the Surface Pen quite a bit. The Surface Pro 3 packs more of a punch than I would expect, while at the same time getting decent battery life. I believe my loaner unit was an i5 with 8GB of RAM and I noticed no real difference in daily use between it and my Latitude E7440 with an i7 and 16GB of RAM. Using the Surface Pro 3 on anything other than a table or desk just doesn’t work for me. So I could use it almost all the time at work, even during meetings, without issue. But it would be frustratingly annoying to try to use it at home, and try I did. Most of the time when I use my laptop at home, and my primary computer at home is a laptop, a late 2013 Retina MacBook Pro, I use it in my lap – either with me sitting on my bed or in my comfy living room chair. My MBP works just fine in my lap, as any real laptop should. The Surface Pro is completely unusable in my lap, whereas the Surface Pro 3, with its adjustable kickstand, is just mostly unusable in my lap. 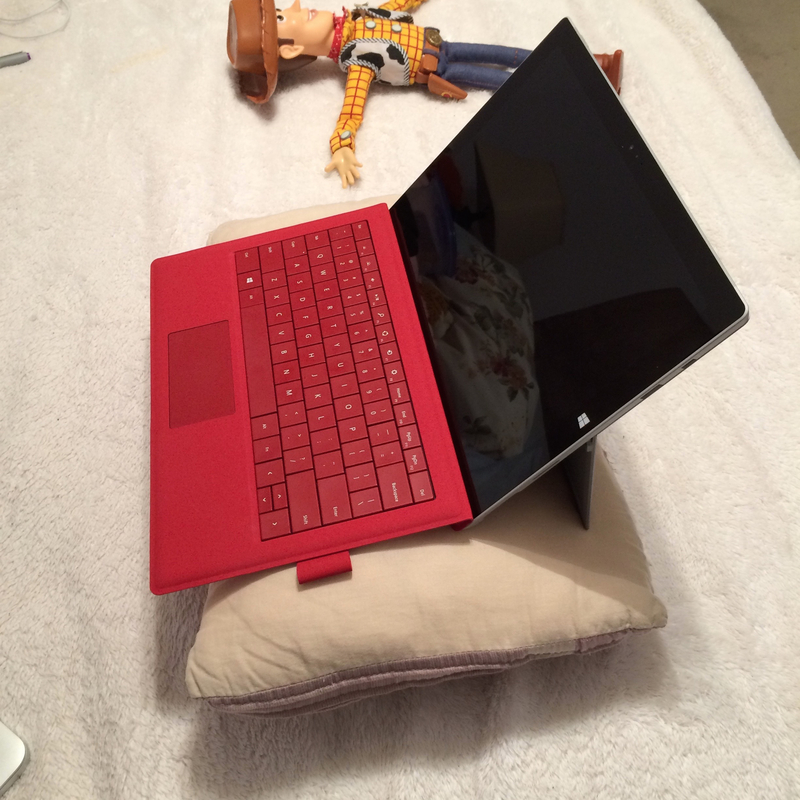 Here’s the workaround I devised to use the Surface Pro 3 at home. Sub-optimal at best. I tried to get used to it, but the truth is, after a couple nights of this, I gave up. The Surface Pro design, with its kickstand, will likely never work for me in my lap. I also didn’t care for the Surface Pro 3 as a tablet, but I don’t blame the device for that nearly as much as I blame Windows 8.1. Windows simply provides a terrible experience on a tablet, in my opinion. I’ve been using the Windows 10 Insider Preview on a Dell XPS 12 for a couple months and I don’t find it to be much better than 8.1 from a touch perspective. The Surface Pro 3 is also heavy – 1.76lbs versus .96lbs on the iPad Air 2 that I use all the time. That 3/4 lb makes a huge difference in a handheld device. The Surface is too expensive for my tastes, and I admit that’s partly due to the fact that it isn’t a device I could use exactly as I expect to use a laptop. A middle of the road Surface Pro 3, the i5 config with 256GB SSD, with a Type Cover, costs $1278, and that’s after a $150 discount that may be a temporary special – otherwise it would be $1428. For that kind of money, I would prefer one of the new Dell XPS 13’s. I think the Surface Pro 3 is a solid device for some use cases. If my boss bought me one of these to use as my primary PC at the office, I’d be happy with it. I’d just leave it at the office, however, as it would be of no use to me at home unless I wanted to start using a lap desk. If I were in the market for a PC to use at home, I would not buy a Surface Pro 3 because I’d have to adapt myself to it, and I’m just not interested in doing that. If you’re looking for a laptop to primarily use on a flat surface that’s lightweight and powerful, with an excellent dock option for full-time use as a desktop replacement, and you’re someone who wants to take notes with a stylus in OneNote, the Surface Pro 3 is the perfect device for you. That’s just not me. This entry was posted in Client Devices, Hardware, Reviews and tagged Microsoft. Bookmark the permalink.